The chief economist of the Bank of England has warned that the UK will need a skills revolution to avoid "large swathes" of people becoming "technologically unemployed" as artificial intelligence makes many jobs obsolete. Andy Haldane said the possible disruption of what is known as the Fourth Industrial Revolution could be "on a much greater scale" than anything felt during the First Industrial Revolution of the Victorian era. He said that he had seen a widespread "hollowing out" of the jobs market, rising inequality, social tension and many people struggling to make a living. It was important to learn the "lessons of history", he argued, and ensure that people were given the training to take advantage of the new jobs that would become available. He added that in the past a safety net such as new welfare benefits had also been provided. Mr Haldane's points were echoed by the new head of the government's advisory council on artificial intelligence, who also warned there was a "huge risk" of people being left behind as computers and robots changed the world of work. 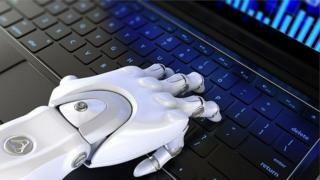 Tabitha Goldstaub, chair of the newly formed Artificial Intelligence Council, said that the challenge was ensuring that people were ready for change and that the focus was on creating the new jobs of the future to replace those that would disappear. Is AI more than just a buzzword? "Each of those [industrial revolutions] had a wrenching and lengthy impact on the jobs market, on the lives and livelihoods of large swathes of society," Mr Haldane told me for the Today Programme. "That heightened social tensions, it heightened financial tensions, it led to a rise in inequality. "This is the dark side of technological revolutions and that dark-side has always been there. Mr Haldane said that job losses would be compensated for by the creation of new jobs as a "new technological wave" broke over society. "That is a much harder number to begin to estimate or guesstimate," he said. "What we can I think say with some confidence, however, is that given that the scale of job loss displacement it is likely to be at least as large as that of the first three industrial revolutions. "We will need even greater numbers of new jobs to be created in the future, if we are not to suffer this longer-term feature called technological unemployment. "It has not been a feature of the past, but could it possibly be a feature for the future? I think that is a much more open question than any previous point, possibly, in history." Mr Haldane said that jobs that focused on skills of human interaction, face-to-face conversation and negotiation would be likely to flourish. Simple manual jobs would be more at risk. Ms Goldstaub said there were great opportunities ahead as well as significant challenges. "What we have to think about is the time in which this change is happening, and it is definitely happening quicker than ever before," she said. "The challenge we have now is ensuring our workforce is ready for that change. "What are the new jobs that will be created whether those are in building new technology, maintaining the new technology or collaborating with the new technology? "There is a hopeful view [based] on the fact that a lot of these jobs [that disappear] are boring, mundane, unsafe, drudgery - there could be some element of liberation from some of these jobs and a move towards a brighter world. "Now that's not going to be an easy journey, but I do believe there is hope at the end of it all." Tech Tent: Is AI more than just a buzzword?